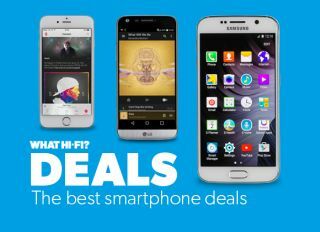 Best mobile phone deals - iPhone 6s, Samsung S7, LG G5 and more | What Hi-Fi? Out of contract soon? Looking for a new mobile phone? Here are the best deals around for the big mobile phones at the moment - including the Apple iPhone and Samsung Galaxy, HTC and Sony mobiles. It can be a minefield to navigate all the best mobile phone deals around today, where have made your job easier by scouring the web for the all leading offers. So, without further ado, on with the deals that have been handpicked with a view to get your more for your money. Apple's smaller screen-sized iPhone comes with many of the features of the more expensive phone, at a cheaper price. Great for video and audio, with the 3D Touch that's surprisingly intuitive - the best iPhone yet. Good audio with hi-res support, great screen and camera - arguably the world’s most beautiful phone. Samsung's made its best even better, with a premium design, strong camera performance and superb screen. Sony's Xperia X sports hi-res audio and a camera with 23-megapixel sensors. A nice return to form for HTC, boasting excellent audio and a bright, sharp screen. An innovative smartphone from LG, with great sound from its Hi-Fi Plus module. Looking for a SIM-only deal? This one comes with a free 12 months of Now TV, Spotify, or Sky Sports Mobile TV.